But I actually love it. Riddick bought me a Kindle. 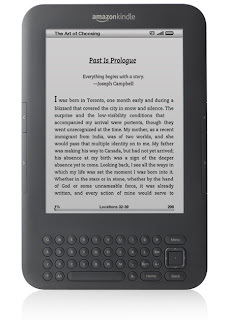 It was one of those moments that I'm not used to, when I mentioned that I would really like something, and he looked at me and said "ok I'll get you one"
But anyway, I love, love, love my Kindle. I was afraid that I would miss the smell of a book, the feel of the pages, and the general idea of reading from a screen. I don't miss those things at all. In fact I like the screen. It is not back lit so there are no glare issues. You have to use a book light in low light, just like with regular books. I like that I can download free previews to books, that makes purchasing the right one easier. It does have 3G access and I can check me email or facebook, but I don't even do that with it. Simply because I am too busy reading it. I highly recommend one to anyone that loves reading, but doesn't have unlimited storage for books, or doesn't have access to a library. Did I forget to say that part? We don't have free access to a library. It would cost me $120 a year to use the local library that isn't even easy for me to get to. So the Kindle is more than convenient and economical for me.